What happened to the second season??? There’s just too much to put in one tiny review. I learned quite a bit while listening. The stories and history were very compelling. I appreciate all the research that went into making this. And on top of that, the music and the way everything was produced and mixed together was incredibly moving. It’s giving me teaching points to help my kids understand American history. So well done! I binged on these episodes and want more!! Impressive podcast - provides a fresh look at some controversial and important issues. Incredible. This podcast will open your eyes. This podcast is incredible. I can't stop listening. It is so informative and has opened my eyes to forgotten and hidden histories of black people during the Civil war and early America. This should be required listening for everyone. Keep it up guys. Excellent stuff here. The episode about George Washington's slaves was especially good. I’m so mad at myself for almost missing out on this groundbreaking podcast. Before I listened I started reading the reviews and (like an idiot), I started to question the integrity of the work. I almost didn’t continue to listen but a few days later I decided to give it a try. I’m so glad I did. The vivid stories told here are provocative, eye opening, and heartbreaking. Everyone needs to hear this side of the civil war. History is a collection of stories. All stories are told from a particular perspective that may not be representative of another story tellers perspective. That doesn’t make these stories false. Anyone questioning the “historical validity” of this show just doesn’t want to hear black stories. And that’s bullsh*t.
Fascinating, engaging, can’t-put-it-down podcast. This podcast covers the America history I wish I had learned, the stories that would have actually made me interested in history as a young person, made me care and relate and see why history matters. Glad I’m finding it as an adult, and so glad his is out there filling out the true stories of this country. Let’s be honest. 95% of us NEVER learned any of the topics covered within this series. I am forever thankful for the Uncivil team for your dedication, commitment, and investment in sharing our history with us. I am changed because of this learning and look forward to sharing with everyone I can. I found this not long ago. Sad to see it’s not still being update anymore. I was shocked by all the crappy reviews. I found it thought provoking and interesting. Although I’m a white libtard from New England, so perhaps I’m predisposed to having empathy for a discussion on Civil war history where the victims of slavery are in the spot light. I think it gives the pensive person more to ponder on race and our current inability to discuss it in any meaningful way today. I can't get enough of this--great job. Thank you!! The genius of this podcast is its ability to upend cherished revisionist perspectives about the civil war, deliver dense historical facts and then follow the facts to their inevitable expression in the present through deeply personal stories. Each episode is both beautiful and devastating. And all in about a half an hour! Truly wonderful. This has been a great supplemental education for my kids’ American history classes. It makes for great conversations about history and race and allows them to show up in class with a little more context and even ready to dispel any myths they’re taught. I’m waiting impatiently for another season! One of my favorite podcasts so far! I’m really enjoying this podcast. The stories really draw you in. I appreciate hearing from folks who can track their lineage and know the stories of their ancestors. I wish I did! Needed a change from the usual podcasts and my friend suggested this. I am a History nerd and enjoy anything Civil War related. This did not Disappoint! I love the honest narratives and little known tales of unsung heroes from American History. Inspiring, engaging, and definitely binge-worthy. Hearing from the descendants of these hero’s makes me feel like I am in their living room hearing their stories. WELL DONE UNCIVIL! Great production and an informative telling of untold history! Please keep the episodes coming. It’s got a lefty bias to it, but this show tells interesting stories about the Civil War and the Confederate revisionism that has powerfully permeated the American zeitgeist. Sons of Confederate Veterans afficionados will be triggered, if any of them they bother listening at all (doubtful). The show teases, though does not get enough into, the sins of the North and the Union. They just barely skim the history of slavery in New York, which is a disturbingly undertold part of American history. I enjoyed when the hosts spoke with actual scholars and historians, not just journalists/writers. Good sound design throughout, wish there were more episodes. Amazing, well-reported, and engaging series that opened my eyes about aspects of the Civil War I had no previous knowledge of. It also really shifted my previous narrative of black slaves as passive pawns in the war; it was so exciting to learn about how slaves and other blacks were actively and effectively involved in winning their own freedom. This is such an important series for better understanding the history of our country, in so many ways that are still relevant to today. I just discovered this podcast, and I wish they would make more episodes. This podcast is so well done! Quickly saddened by the one off comments that put opinions in place that reflect their modern day thinking. It’s a shame. Still going to give it a try because these stories are things I love to find out about. This is real history being told like never before and it must be listened to by all. When we understand real history we can be empathetic instead of fearful and angry. Great show! Please make more episodes!! Excellent stories told from a different perspective. The African American story is hard to come by. The negative reviews and comments tells me more about the commenter than the podcast. Sad that in 2018 people are still in denial nor want to hear or consider the disgusting history of this country and what black people had to endure. Most of the stories that are talked about are new to me. It’s a great listen. Well done. This podcast and the stories contained have been essential in my re-education about the Civil War and America’s dark past. Highly recommend. It feels like the agenda is getting in the way of honesty. This provides an amazing perspective on the civil war! Growing up in the south you only receive one side of the story, it’s wonderful to hear a different perspective! 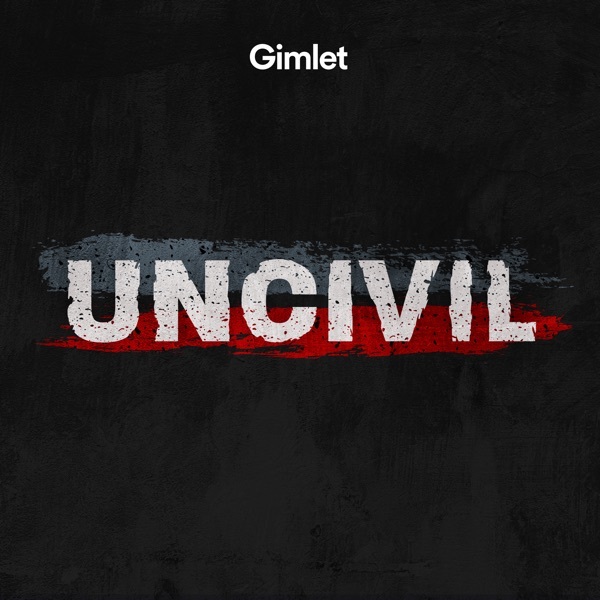 Uncivil tells the untold truths of slavery - it is an incredibly powerful podcast that ALL should listen to! Let history be the judge and the truth be told... it was all about keeping their slaves It made them a fortune why give it up? This podcast obviously tells riveting, heart breaking and inspiring stories that make me want to be a better ally (w/f- don’t tell me race doesn’t factor in to these reviews) and then reading these one star reviews is HILARIOUS. “I thought this would be about the civil war and not African American people”- umm, what was the Civil War about again? You guys are gorgeous and I hope this gets these stories out. There’s like 1 troll giving poor reviews under multiple usernames here. This podcast is fantastic! Giving you stories that you’ve probably not heard before. I’m happy this Podcast exists and the world is better for it. Keep up the great work!! Pleased to see more episodes from this compelling series. Their perspective is particularly relevant in this time of rising white nationalism. This is a great podcast! Very well done. Enlightening, entertaining, and revealing. I’m a civil war buff and I learned things that I think few people actually know or appreciate. Phenomenal podcast. There will be more, right? More please. This was so good. When are you coming back? It was excellent! I love this show, the whole country needs this show!!! When is it coming back? I loved this show!! Okay, I'm a history buff, so this podcast sounded good to me even before I listened to the first epidsode. Right now I'm almost finished, and I have to say, this podcast rocks. The hosts, the writing, the tone, the music, the subject matter: it all just clicks. I'm hoping we can expect more episodes.